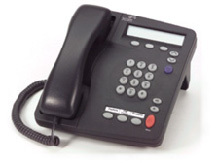 The 3Com NBX 2101B Basic Phone (3C10248B) offer affordable, simple, and powerful 10/100 Ethernet connectivity, with four dedicated feature buttons, three programmable buttons, and up to two call appearances. Two-line displays provide caller ID information and internal name directory access. Does not require an additional license.